Though out of business since the mid-1930s, the name Duesenberg still resonates for many in the automotive field. For a little over two decades, the company produced luxury vehicles distinguished by their front bumpers: two pieces of steel with the top piece bent, creating the look of a bowtie. It was equally famous for its logo, a gold eagle emblazoned with �Duesenberg 8,� referencing the racing engines developed by the company founders which were influential in the engine design of their renowned cars. The Duesenberg Straight 8 Neon Clock pays tribute to this beloved car, albeit minus the gold. Still, it would make a great gift for any car enthusiast or mechanic who embraces auto history. The time piece was designed with the latest tech, while managing to retain an old fashioned feel that�s reminiscent of clocks you might have come across in a road side diner, or greasy garage of another time. It has a distinguished 20 inch face with soft gray numbers and imaging. The manufacturer was careful to use only premium materials to produce the wrinkle free, powder coated and hand spun metal bezel body. The entire face can be brilliantly highlighted in a soft neon glow with the flick of a switch. The half inch tube promises to hold up for well over a decade, or more than 100,000 hours. The designer of the Duesenberg Straight 8 Neon Clock, Image Time Neon Clocks, built its reputation paying homage to Americana in all its forms. Utilizing the expertise of quality machinists, craftsmen and graphic artists, clients like Pizza Hut, KFC and Hooter�s have partnered with them for branding neon clocks that impress. We doubt you could find any Duesenberg car lover who wouldn�t want this one on their wall, highlighting their shop, man cave, garage, sports bar, dealership or diner. If you love and respect the Duesenberg, then you will totally appreciate one of Jay Leno's Garage videos about the very last original owner unrestored Duesenberg. Jay of course restored it, but this is a great tribute video to the Duesenberg! 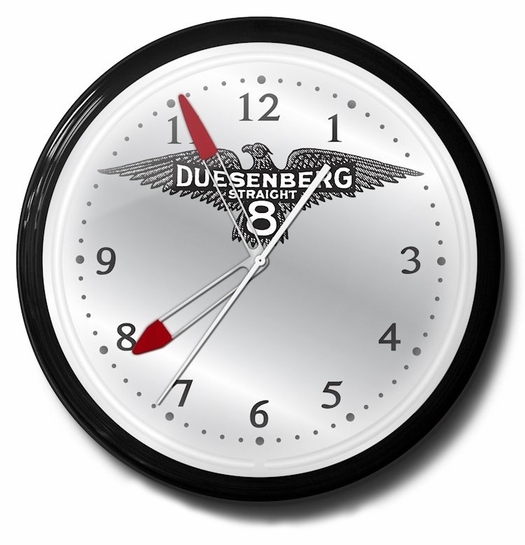 The Motor Bookstore is happy to sponsor the high-quality Duesenberg Straight 8 Neon Clock. We never stop striving to maintain a library of licensed and well-crafted materials for all car lovers. Ask a question about Duesenberg Straight 8 Neon Clock.